Breakfast was meager, the second bad one and the worst of the two. We packed our bags and were downstairs for breakfast by about 7:20. The fried eggs were tough and rubbery; sausages were fine; baked beans (I didn’t try); rolls were hard as in stale. For fruit: only halved bananas (cut ends black); sliced white bread; cereals as usual and milk. Coffee and black tea were good. Lily admitted breakfast at this hotel wasn’t great. 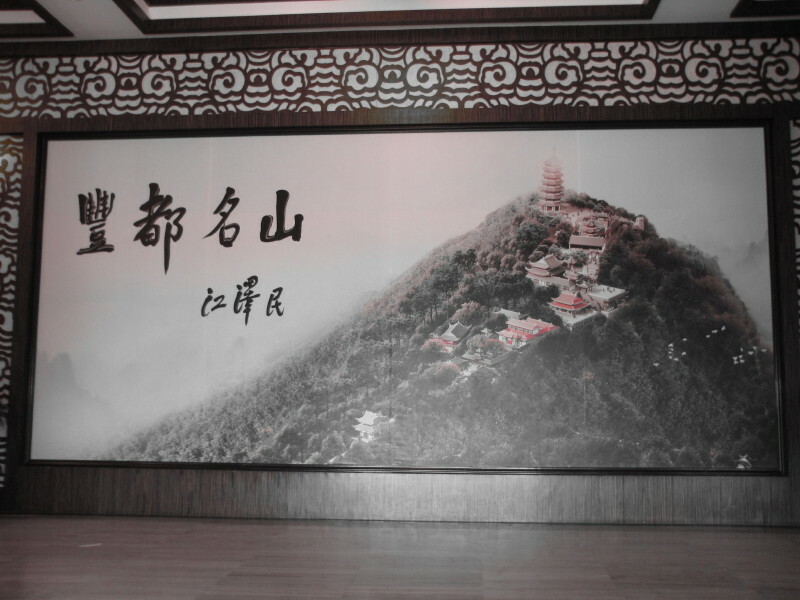 “It is the best hotel in Yangzhou and it is a small city; they try their best.” She added this hotel is large and caters to many Chinese travelers as well in another room. Tourists are in separate rooms or there would be a big mess. Really? What kind? In all previous (and larger) hotels, Chinese and foreign travelers had breakfast in the same area—no problem—with countless buffet choices for everyone. Our luggage had to be outside our room by 8:30 a.m. and was picked up at precisely that time. I snooped when I heard activity in the hallway. We’d packed before breakfast and still had about 40 minutes to read and wait for the bus. Before we leave this hotel, I must share a discovery. 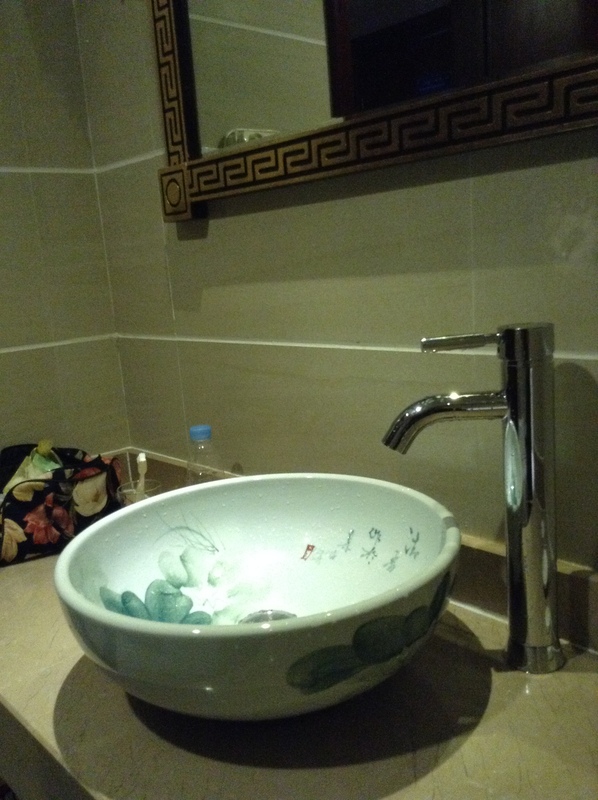 Instead of a sink, the bathroom had a wonderful bowl on the counter, but the faucet wasn’t arranged properly and water splashed all over the counter when in use. I heard a strange sound as the water disappeared down the drain. I turned the water off and on again. Same sound. I had to take a look beneath the sink and laughed my head off. 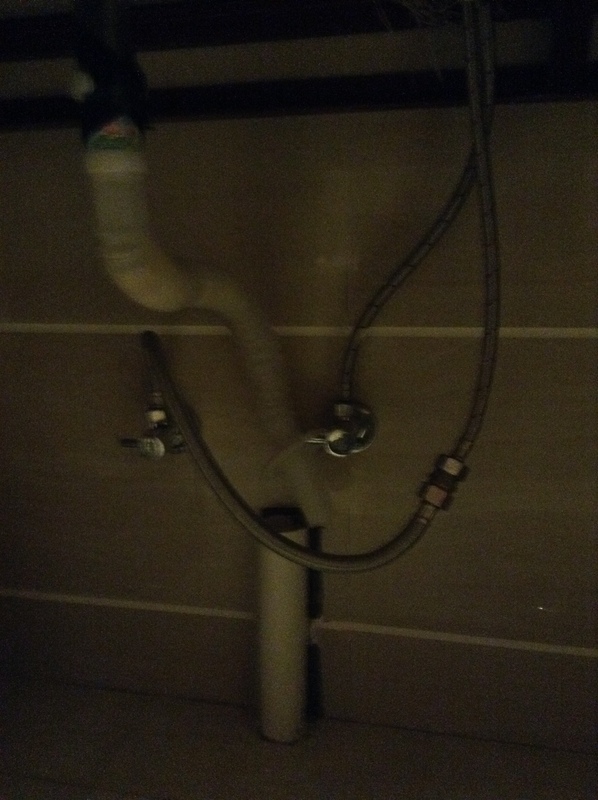 My apologies the picture is somewhat dark: regular pipe leads from the drain as well as through the floor. See the loose plastic tubing in between? It’s just long enough and not secured. I pulled it out for you to see and wonder if our room was the only one with special plumbing. The bus ride from Yangshuo back to Guilin again took 1-1/2 hours. “The ride will be bumpy,” Lily said. She grinned and called it a back massage. Thank goodness the bus had padded seats, not bare wood planks. As well as our tour company, Lily also works for another one, which caters to Americans who come to adopt Chinese children. She likes being freelance and enjoys meeting people and hearing their stories. While on the bus, I caught sight of a woman riding her bike in stocking feet. Her boots were tied on the handlebars. I also noticed my first set of twins alongside another sibling. Till now, we’d seen only singular children and mostly boys. I watched a man wash the dirt off his bike with water from a mud puddle, scooping it up with his hands. It wasn’t a fancy operation but appeared efficient. As well, several times I noted a female driving a scooter with a male passenger. Yes, believe it, or not. I wonder if this means she makes better money or is a better penny Yuan pincher? It’s obvious she owns the wheels. I noticed only a couple dogs during this trip and a pampered few, tightly held, in the city. In the country, we passed several dogs sleeping in the dirt on farms as we made our the way to the River Li cruise the day before. A five-cubic foot freezer is about 2200 Yuan (approximately $360 USD). Back home we can buy one that size for half that amount. Yes, people in the cities have money to spend, but I didn’t hear a reason why it’s so expensive if this popular here. Of course, farmers are still behind the times with old washing machines or none, and no freezers. They don’t have electricity anyway. When a husband likes shopping, his wife does not. When you marry the right woman, you are complete. When you marry the wrong one, you are finished. Categories: #travelChina, China, holidays, travel, vacation | Tags: Guilin, Yangshuo | Permalink. 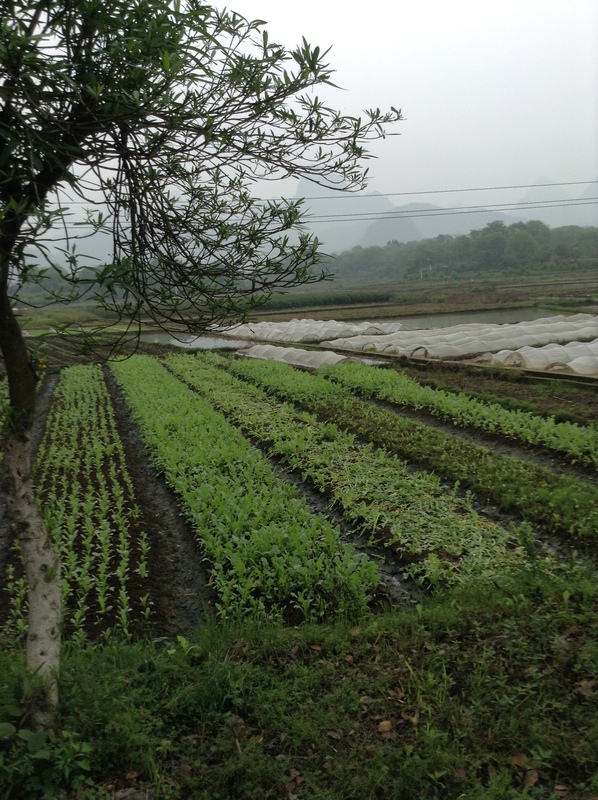 After breakfast, the bus driver headed through the Yangshuo countryside to the Li River. At the concert the previous night, no-one clapped, no-one shut-up; everyone had a camera taking pictures and videos. A sea of cameras lit up the dark like candles throughout the audience. What a sight. All land is owned by the government. If you want to build a house, you must apply to the Village Committee (like a village government) and apply to lease the land for 70 years. Sometimes, you can renew the lease and pass your house, apartment, condo or especially farms, until the government has other plans for the land your family has lived on for hundreds of years. 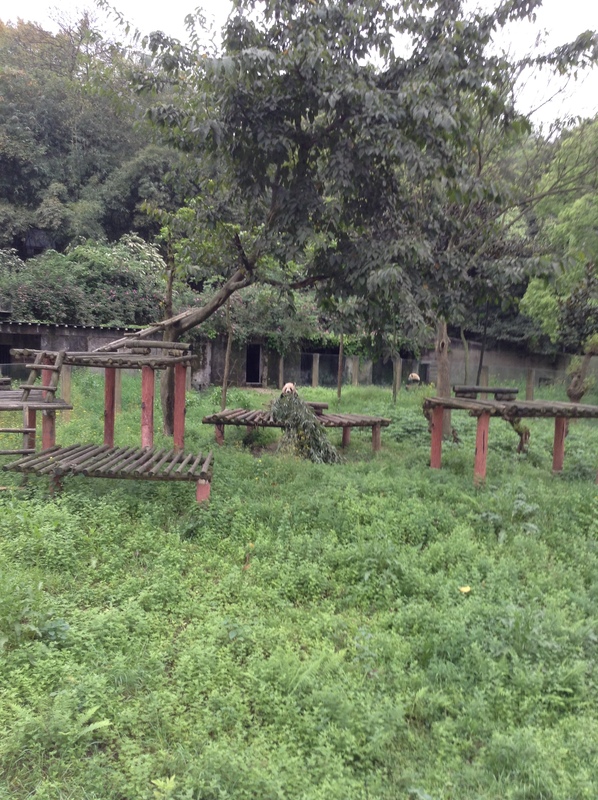 We stopped at an old farmhouse along the way to the River Li for our cruise. 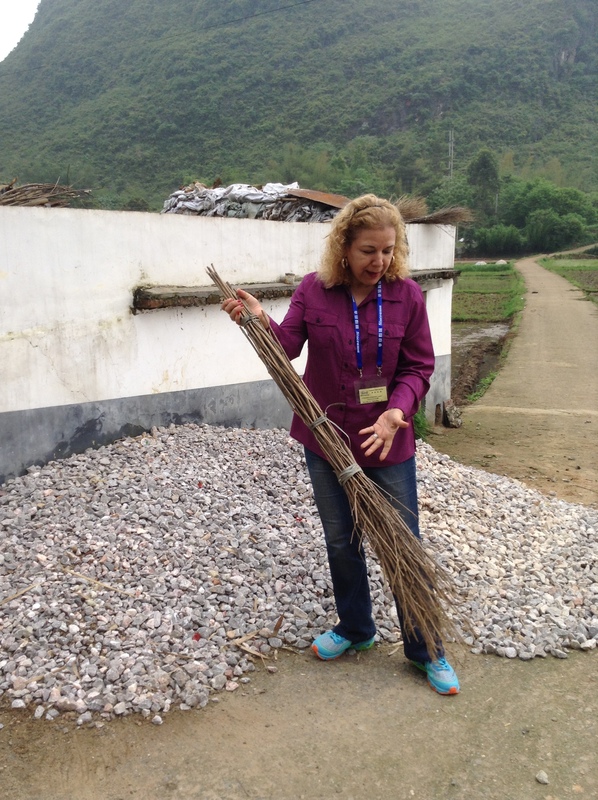 Here a Caucasian tourist tries out the old-fashioned broom. Down a country road, lined with stands of food and trinkets for sale, we followed Lily, our guide. The people stared at us and we tried not to stare back. Our cruise boat was old and rusty, run by locals and not what I’d call clean. No health and safety issues here. The gangplank had wood rot (holes in it) and I stepped carefully. We sat topside instead of inside on old wooden chairs (and a couple new benches) as the weather was co-operative. The locals must earn a living any way they can. Of course, there were trinkets inside for tourists as well as soft drinks. We were about 25 tourists onboard. One woman with her son and daughter and another mother with her daughter (all in early teens) and a couple families of flip-flop-clad Australians with six youngsters between six and 14 were all onboard. I felt in good company in my flip-flops. No way could I have worn runners. My feet at this point felt broken. We passed water buffalo on the shore and for the first time, noticed countryside litter: plastic bags and empty cigarette packages. Electrical towers were seen in the weirdest places, in the middle of nowhere, but most farmers still live in the old ways. They have a well, but no plumbing. Winter (January / February) is not good for tourists. It is too cold and there is no heating system here. One must sleep in a coat. On the other hand, summer is hot and humid and the opposite around July. Another drawback, the water level is high on the River Li and not good for water travel because it is too fast and dangerous. Categories: #travelChina, China, cruise, holidays, lifestyle, travel, vacation | Tags: journey, Li River, Yangshuo | Permalink. After the tea ceremony, we (rich) tourists were whisked into another salesroom. Inside, various teas were for sale, as were copious types of teapots and tea sets. Some cost almost as much as my all-inclusive holiday in Canadian dollars. I stepped back, hands tucked in close to my sides for fear of an accident. Had I even paid attention to how many pieces made up a set? No, I’d been too petrified to look considering the cost. I waited by the door like a child. Before continuing on to Yangshuo by bus, the ladies inquired about the facilities. We traipsed down a long corridor to a small, clean washroom. Inside were two stalls with pedestal toilets. Wow! The cubicles had (approximately) three-foot wide shutters for privacy installed in about the middle of the door frame. Picture a restaurant kitchen door hung lower than usual. Anyone might look over the top as she walked past. The one I used didn’t have a proper latch to secure it and I laugh remembering my gymnastics securing the door and… you know. 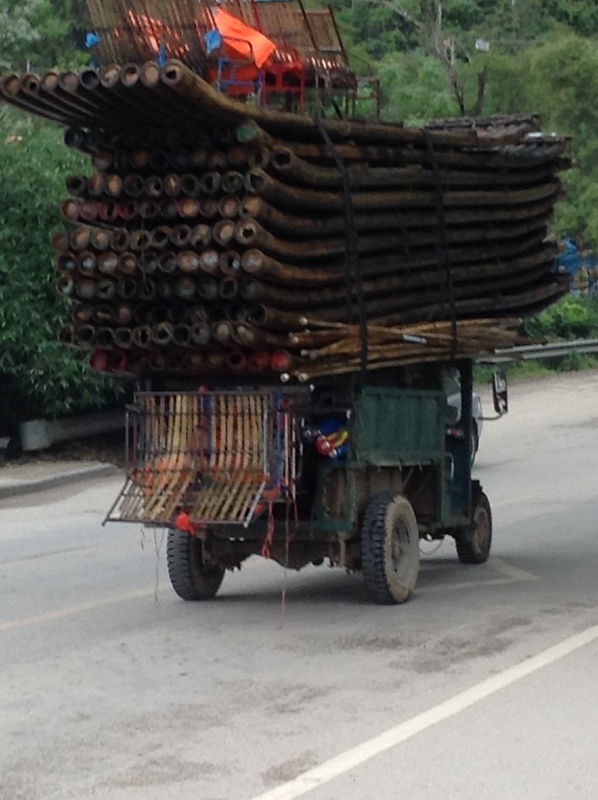 Have you ever seen such a small truck with this impossible load of wood on its roof? How’d anyone get it loaded anyway? The highways were unbelievably neat and clean. No garbage, paper, or plastic were in evidence anywhere as all the highways we’d been on so far. The land is government owned (as in all of China). Must renew lease every 70 years. At last, we arrived at the hotel. Time to freshen up and have dinner. The hotel appeared too quiet as we settled at a table in an empty dining room. All throughout dinner we saw only the waitress. The smell from the bathroom invaded the dining-room. I couldn’t understand such a thing in a hotel of this significance. Phew. I hadn’t been aware of anything like this elsewhere. I asked Sue about it, but she hadn’t been conscious of anything unpleasant. After dinner, we rushed to attend an open-air performance (see video below). By the time we arrived in the main park the sun had gone down. 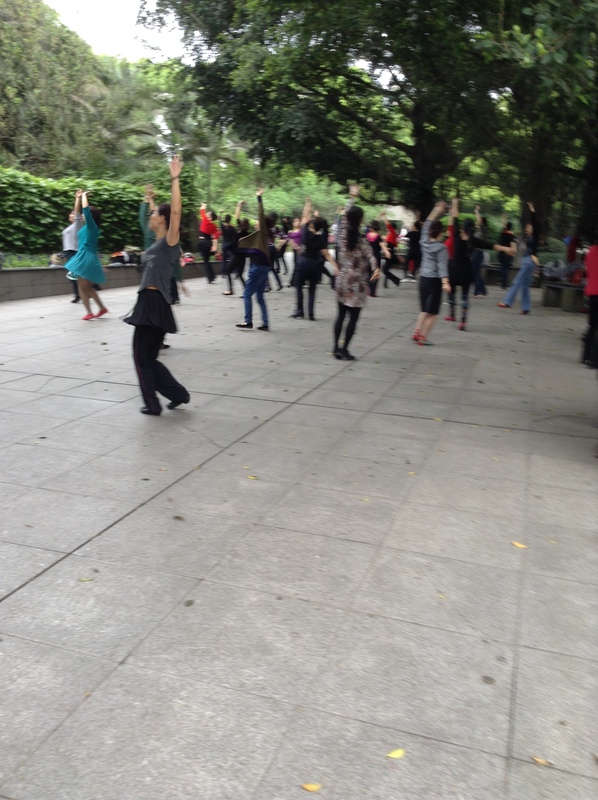 At first small clusters of people walked around us with lots of breathing space in between. By dusk, the crowd swarmed like a maelstrom with a mind of its own. I hugged my bag against my chest, arms tucked in as close I could manage. Our English Group Eight clung together with Lily, our guide, ahead of us and tried desperately to keep her in sight. She stopped a couple of times and waited. What made the situation worse was the dark. There were no park lights. I felt blindfolded. Never have I experienced this tight a convergence of bodies around me. I confess terror struck me for the first time since we’d arrived in China; terror the crowd might rip me from my fellow travelers; the terror of being lost and disoriented in a foreign country where I could not see. Lily left us to buy entrance tickets and suggested we wait while the crowd thinned out before taking us to our seats. She wasn’t allowed to sit with us. We took our seats after she explained where we’d find her when the performance ended. Our seats were good in about the third tier up. The show was like nothing I had ever seen. This video doesn’t do it enough justice. You had to be there. 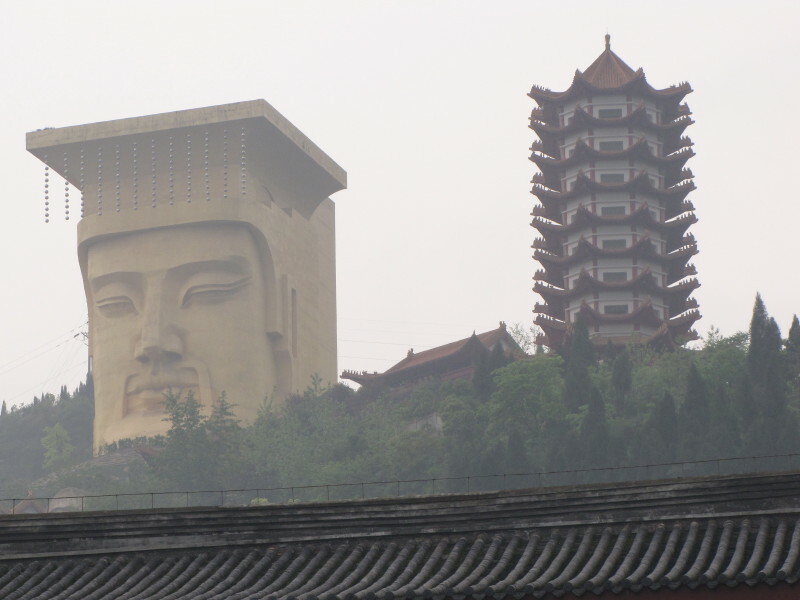 The Chinese sure know how to put on stunning presentations! Enjoy. I am currently on an unplanned sabbatical. Please bear with me. I hope to return soon. Thank you for reading. I DO appreciate your kind and continued support more than I can express. Categories: #travelChina, China, food, holidays, travel, vacation | Tags: Yangshuo, Yangtze | Permalink. How precious is a pen? I’d brought four with me and lost one. The last one is almost out of ink. What will I do if I can’t scare up more or another one? I like gel pens but hadn’t remembered how fast they run dry. I scribbled a lot, I suppose. At home, I’d pull another one out of my stash of dozens. Why hadn’t I brought more? The 3:00 p.m. extra excursion was reinstated: Ghost City Tour and Stairway to Hell in place of canceled Goddess Stream Tour previous day. To visit Hell and Ghost City, we climbed (we were told) 500 steps. No, it wasn’t continuous. The ground leveled out at intervals and showcased temples and statues and bridges etc. I stopped counting after 10 or 11 steps as I huffed and puffed to keep up with the crowd. With no illusions about completing the ascent, I soldiered on. Talk about a workout in muggy weather yet! Look wa-ay-y up! Model of Temple of Hell. Many tour groups crowded around their guides, who used megaphones to be heard over other guides. It was too noisy and congested for me. I gave up listening. The way down sloped at a steep angle; I was careful not to fall on my face. The road was paved and wide enough for a car but used for foot traffic. Members of my group had disappeared. Some had lost interest and turned back to the ship. I came down alone. At one point I saw no-one and heard only birdsong and my runners thump against the asphalt, then, another set of footfalls clunked behind me. My heart in my throat, I stopped to pretend-fix my laces and caught sight of a man fiddling with his camera. I wasted no time hoofing forward till I reached a bend in the road and saw people milling around. My second experience since Shanghai, I came upon a disfigured man lying on the ground, begging. It appears these poor souls are well hidden from tourist’s eyes. At the bottom, we’d come through an open market. This time a particular display caught my attention. I stopped and bought a bottle of wine (either Great Wall label or Dynasty). After a brief negotiation, I paid 50 Yuan or $8.30 USD. Outnumbered thousands to one, I found myself surrounded by Chinese tourists and the loud chatter of exuberant Chinese voices. Taking a deep breath, I approached the closest open mini-bus and said the name of our ship with a dramatic question mark attached. The driver nodded. Everyone stared at me, the foreigner. The driver waited to fill two more seats before proceeding toward the river. We were deposited at the top of a hill where more stairs awaited downward bound. I jumped out and booted it down the stairs, down the long walkway to another semi-enclosed market where the locals gawked at the lone westerner. At least that’s how it felt. I passed men guys eating noodles. boxes of wine, cases of soft drinks and beer, and other foodstuffs. Hot and sticky, I wanted a shower and to cool off. I’m surprised my legs held me upright after all the stairs I’d scaled in the past couple hours. Guides waited along the way directing those returning through two—or was it three—ships anchored side-by-side. I recognized no one. What a lost feeling surrounded by only Chinese! After a quick shower, I enjoyed cool air on the balcony where an almost breeze teased me but not for long. Tourists hanging out over their balconies blew smoke clouds about, some of the smell settled on me and in our room. I went inside and shut the doors. Smoking in the state rooms wasn’t allowed. Alarms installed in the ceilings kept guest honest. Puffing outside was okay. Our last night on the cruise had arrived. Time to dress up for a fancy Captain’s Farewell Dinner. 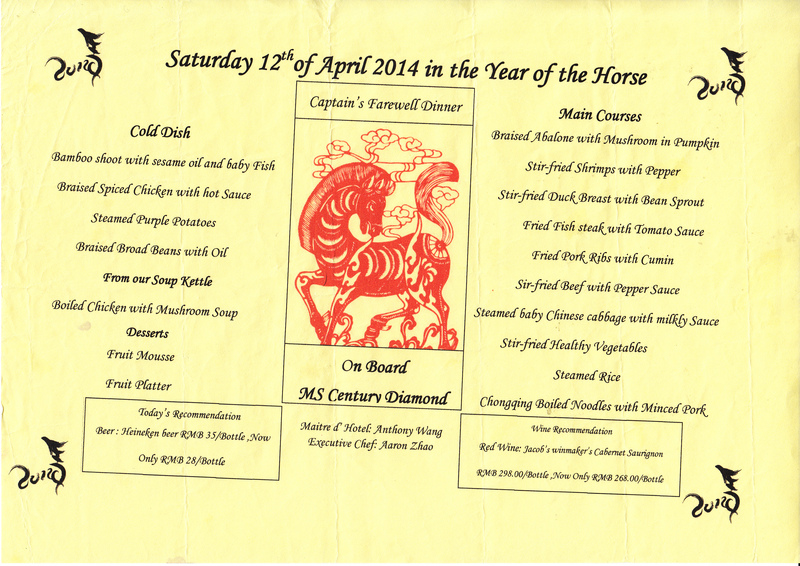 This is the only time we had a menu for any meal on the ship, not even at the Captain’s Welcome Dinner. This was a dress-up affair again and I felt glam and extra tall in my four-inch spikes. After dinner, we paid our shipboard accounts and packed our bags, which were deposited in the main lobby. I hated always leaving my luggage out of sight. I was ready to get off the ship and looked forward to a new adventure in the morning. This link gives brief blurbs about the various ghosts. This one provides a 4.12-minute tour but is difficult to understand. 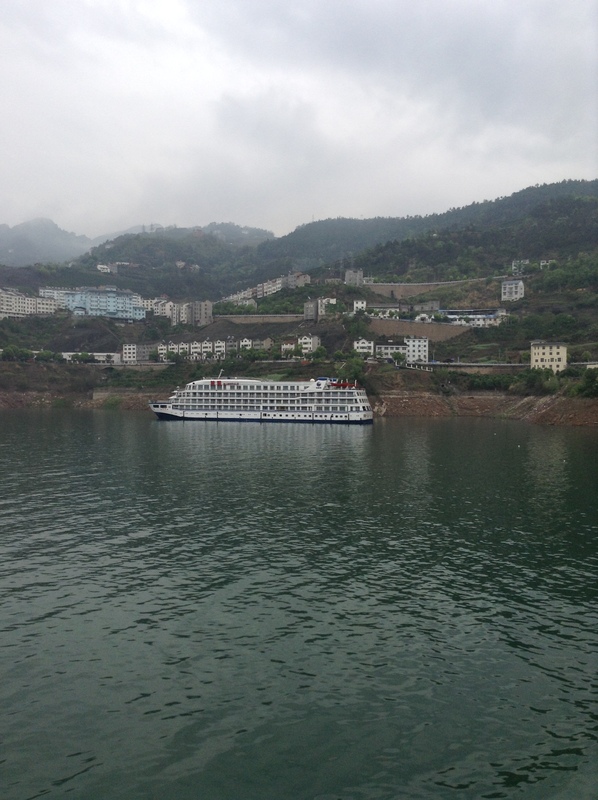 Categories: #travelChina, China, demons, food, holidays, lifestyle, travel, vacation | Tags: cruise ship, Yangtze | Permalink. We woke at 6:25, dressed without showering and headed for early breakfast. 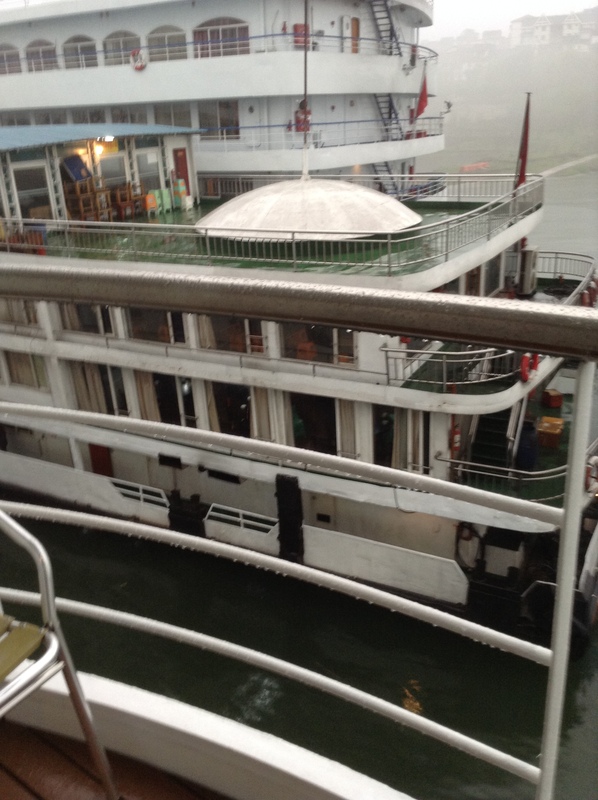 After the cancelled excursions the past two days, I noticed passengers appeared antsy to go on the Shibaozhai trip, scheduled for 7:45 a.m., weather permitting. No cancellation was announced at breakfast. By the time we arrived in our rooms, a reminder blared over the PA for anyone leaving the ship to pick up a ship’s pass. The tour was on. Sue proceeded to take a shower after breakfast as I plopped into the chair at the desk. The outing hadn’t interested me because of the damp drizzle with or without an umbrella. My heart stopped. 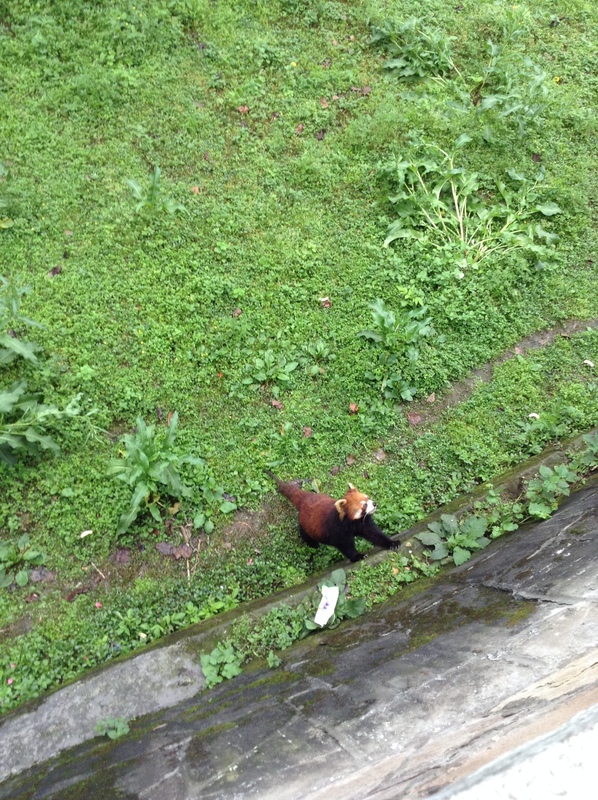 I glanced out the balcony doors and gulped. A ship coasted towards us and I knew we were going to crash. I leaped to my feet. I don’t know why. Not unlike a pillar of cement, I froze poker straight expecting the inevitable crash. We were going to die and I was powerless to do anything about it. The drifting stopped mere inches away. How did the captain(s) do that? Everything trickled rain: the balcony floor, the railings and chairs. I read the name on the side: President Cruise. The ship was smaller than ours, old, and rusty. Curtains hung haphazardly missing hooks on rods. Clothes lines strung with laundry crisscrossed inside the rooms so close I could have reached across and pulled them off—maybe not quite—but too close for comfort. The Chinese passengers who came out on the back deck (the poop deck, I think) to see what was happening didn’t appear well-off. A third ship moved alongside the second one, bigger than both of us: the Century Emerald. It drew closer and closer. The curtains pulled back, windows on the main deck revealed a fancy dining-room featuring round tables draped with milk-white cloths and bright yellow chair covers featuring bows on the back. The third ship floated towards the one between us. I waited for the crunch. It didn’t come. I watched a female cleaner (maid?) wipe down the railings on one of the balconies. What a hard worker, but why bother with this useless task in the continued drizzle? The fumes were suffocating and the engines noisy even through the closed balcony door. The rusty, middle ship moved away in the opposite direction. Once again I held my breath as the Century Emerald inched towards us so close I could almost touch their balcony railings if I stepped out and leaned forward. A few curious international passengers on the Emerald watched us for a while. We were watchers watching the watchers. Soon, they returned to their rooms and closed the curtains. Maybe we weren’t that interesting. The temperature in our room reached a high of 24, the highest since we boarded. I opened our curtains and doors again for fresh air, but not for long. The noisy engines were deafening and the air fuel-stinky. Why run the engines? Weren’t we anchored? The ships remained side-by side like strangers on a first date. Sue lay on the bed reading with her swollen feet up on the headboard (actually the mirror above it). She’d suspected the moving bubble above her toes might be a pocket of blood. If she’d had a needle, she’d have drawn out the liquid. I suggested she see the ship’s doctor, but she refused. Twice in ten minutes, Housekeeping came to make up our room. We said we’d do it ourselves, but that wasn’t allowed. I have become lazy since we boarded, but I can manage making a bed. Anyway, what’s wrong with some down time after all the running around we’ve done since our arrival in China? A Captain’s Bridge Tour was announced over the PA, but I felt too lazy to move. Maybe I was still feeling the effects of our near crash. A different language presentation was scheduled and announced every quarter hour from 10:00 to 11:15: in French, English, Chinese, Spanish, and German—not in that order. The interruptions soon became a nuisance. Categories: #travelChina, China, cruise, holidays, travel, vacation | Tags: danger, Yangtze | Permalink. The Wu Gorge had been scheduled for 4:30 p.m. with dinner following our return at 8:30. However, the day turned wet with light rain and mist by midday. A PA announcement advised dinner time change to 5:30 with departure at 6:00. Hello, heartburn. I wondered if this was worth the both due to the spraying drizzle and low ceiling clouds. I thought maybe an adventure awaited and against my better judgment, rushed to catch the bus with our group. Robert, our first guide in Beijing, had another group onboard. When we left for the Three Gorges Dam, (the world’s largest hydro-electricity project) he took 0ur English Group 8 under his wing. A local man, Max, was our bus excursion guide. I don’t believe he knew how to do anything but smile and appear happy. Even over the loud speaker, his soft voice and thick accent were difficult to understand and he wasn’t informative. At one point, Robert pitched in to help. Rain pelted the bus as we continued. After traveling over scary, wet and curving roads, we arrived an hour or so later. Too dark to see anything, we were hustled into the Visitor Center, the surroundings shrouded in fog and shadows. The women visited the Happy House as the first order of business. We lined up for tickets to see the indoor model of the gorge. It was stunning. I took pictures but replicas are not the same as the real thing. My hands shook with excitement, grateful we’d arrived safely. I was happy to see the reproduction but disappointed we would not see the real gorge. The real deal wasn’t in the cards. Whose idea was it to go ahead with this tour so late (in rain, fog, and dark)? Might anyone be anything but dissatisfied? I was, wouldn’t you be? All manner of souvenirs we’d seen everywhere were displayed in the gift shop: pearls, various colors of jade, tee shirts, as well as books about the Gorges. Ten minutes for shopping and then outside into the drizzle with the local guide (Max) to the observation area, which I couldn’t make out (dark and rain mist). The pillars he pointed out were swathed in mystery like in a bad Sci-Fi movie, similar to Mount Olympus in the clouds, all mist, and vapor with an inky black void below. 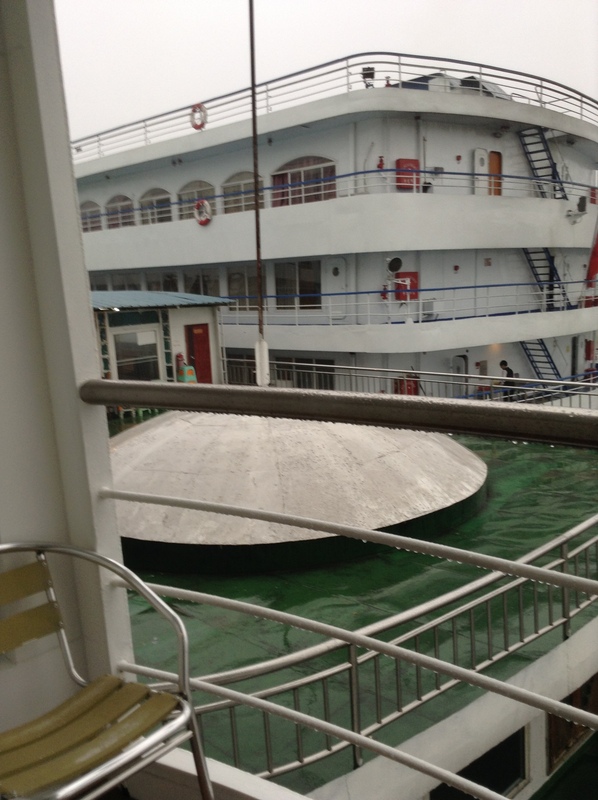 Robert announced our urgent return by 9:30 because the ship had been scheduled to go through the locks by 1:00 a.m. I had doubts about the bus tires in the rain as we rushed back. What a waste of another hour plus the cost of gasoline. Rush. Rush. Rush. Rain and dark proved to be bad companions for an enjoyable tour. I decided to disregard negative feelings, but in truth, I should have paid attention to my gut. The trip was a waste of three-and-a half-hours, driving in rain and biting my nails to stubs. Upon our return, crew members with flashlights lit our way back from the bus to the ship because of the dark and slippery conditions. Weird what wet weather and misery will force me to do. I almost believed their words. Not. China Policy since 1927: only 1 child, now changed to two. If 3rd one, you’ll be fined just as you once were for more than one. Preference is a boy, especially in the countryside. Costs 6,000 to 7,000 Yuan per year for baby age 3, 4, or 5 in Kindergarten (morning drop-off, lunch, short time sleep. Grandparents or parents pickup). Costs more than primary school from age 6 (learn music, politics, English from grade 3 or 5). University: 3, 4, 5 or 7 years, must pay depending on profession studied. Must pass a college entrance exam before being accepted into college or university of choice. Categories: #travelChina, China, cruise, holidays, lifestyle, travel, vacation | Tags: Three Gorges Dam, Yangtze | Permalink. I awoke before six again too lazy to rise until seven. Sue and I moseyed down to breakfast and were the first arrivals at The English 8 table. I liked our waiter, who was young and sweet—maybe 17—cute too. I hated the thought he was endearing only with hopes of a tip at the end of our trip. Tips have already been paid according to our travel agent, but some of our group still tipped our guides at the end of their turn with us. The room for a 9:45 scarf ‘class’ was packed. Every female on board must have been in attendance with a few husbands in tow. The demonstration was great, but I wasn’t. Sue did well with the scarf creations, but I struggled and sucked at it. I did learn a couple of new ways to wear a shawl, but all the new scarf strategy escapes me now. I succeeded in not buying a scarf as I have too many at home already. Later, we watched a PowerPoint presentation about the Yangtze and its interesting points. I couldn’t bring myself to scratch any more notes. Later in the presentation, I found myself nodding. My chin dropped to my chest and I sat up with a start. It was warm in the room; I hadn’t done anything physical since we boarded the ship. I didn’t fault the presenter (Ivy), yet on the other hand, I did. She wasn’t animated during this informational dump and sounded like she was reading a boring article, or maybe she was bored. Two movies were suggested we look up on the internet: Still Life and Up the Yangtze. I haven’t come across good links for either of these yet. Afterward, Sue took 40 winks while I typed up notes. We’d decided against an early lunch because we weren’t hungry. Big surprise. Our goal was to go for 12:30 and have salads only, and of course, I had wine. Three glasses. Tsk. Task. The cruising life is not for me. I need to walk, explore. Move. Thai Flavor Beef Salad with Fish Sauce; Fruit Salad; Garbanzo Bean Salad (with leftover sausage from breakfast, I’m sure); Pig ear with vegetables (no thanks); bean curd with shallot; mixed five-bean salad (just cold vegetables: corn, peas, beans etc.). Romaine; large purple cabbage leaves; sliced purple cabbage; grape tomatoes; carrot sticks; raisins; crumbled real bacon; sliced black olives; three dressings: Italian, Thousand Island and French. Rice balls; steamed chicken and straw mushrooms with soy sauce; baked purple potato; braised squid; pasta with tomato sauce; steamed egg; Litchi meat with sweet and sour sauce; fried fish with garlic; stir fry vegetables; steamed white rice; beef and carrot soup; stewed spare rib soup with wax gourd (is this yesterday’s leftovers? ); buns. 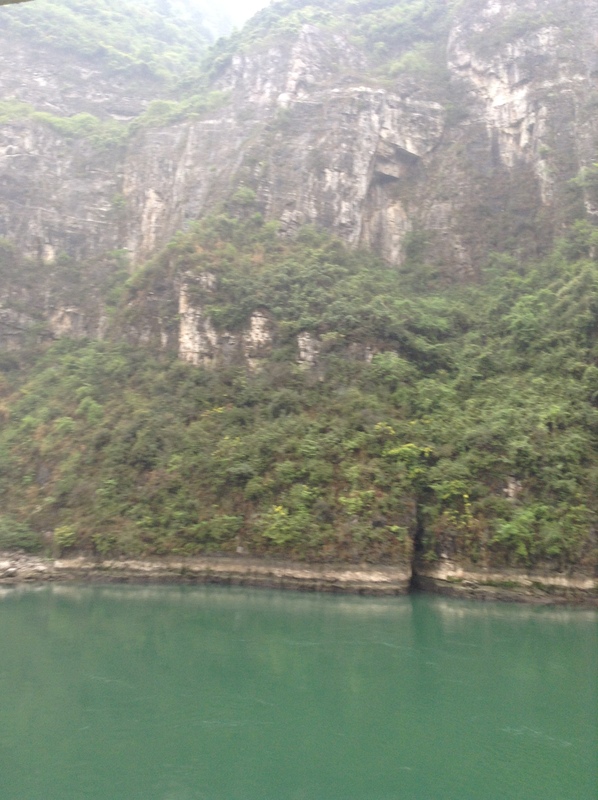 At 3:00 p.m., I noticed the Yangtze River was green, like real water, not the yellow soup I mentioned earlier. Imagine that. It was foggy and it had rained in the morning. Our ship kept sounding its horn. 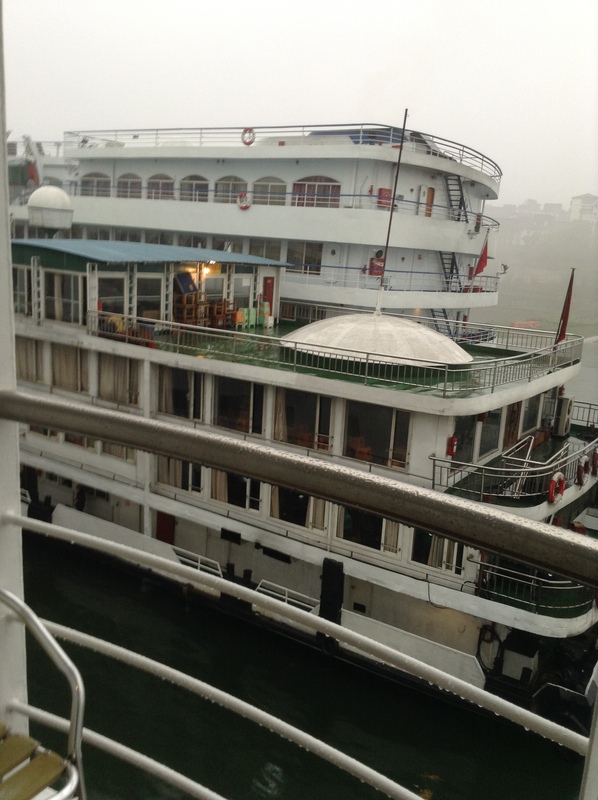 At lunch an announcement was made: because of the fog, river traffic was one-way. The possibility of making the 4:30 time-slot for visiting the Gorge was uncertain. What did this mean? If we were moving forward and in the traffic lane, what was slowing us down except for the fog? It wasn’t that thick. What did one-way traffic have to do with anything? All this was confusing, with no answers offered. Departure time for the Three Gorges kept changing. The fog continued, as well as the rain and it was dark and after six o’clock. I didn’t care if we made it to the Gorge even if they had night lights there. What would be the point? Despite the wet and overcast weather, we were finally on our way. I entertained thoughts of a cozy bed and a good read instead. What kind of jam cannot be eaten? A traffic jam. Categories: #travelChina, China, cruise, food, holidays, travel, vacation | Tags: Yangtze | Permalink. Sue returned livid from the morning’s excursion to the Red Cliffs. It had been awful, she told me. The group had started with 26 people and ended up with six. Why did some say it had been a wonderful tour when Sue thought it was a waste of time? Why didn’t people tell the truth? There had been nothing to see except fake building fronts. The onboard doctor and his assistant gave a Chinese Medicine lecture, primarily about acupuncture. I found the presentation interesting, but I’m sure the purpose was to drum up business. A line of people signed up for a consultation afterward. I believe a fee figured in there, but I don’t remember clearly. Later, an hour-long old documentary was shown about the Three Gorges Dam and the evacuation of the people. We dressed up for the Captain’s cocktail party (6:00 – 7:00 p.m.). I wore a long sundress and my favorite four-inch heels (hard to put on over bare feet, but no way was I wearing hose). Sue dressed in a skirt and top and her new shoes, but her feet and ankles were still too swollen. She felt self-conscious showing them off and changed into pants. Up the stairs, we toddled in our finery. The crew was lined up in the foyer, on Deck 5. Flutes of cheap champagne were handed out and the crew stood in a receiving line outside the entrance to the bar and restaurant. I was startled that the captain was the shortest male in attendance. He had nice teeth and his smile made me think of a certain Russian leader–a shorter version. Why had this crossed my mind? I can’t make this stuff up. Honest. Four females partnered with male crew members started the dancing. Not all danced ballroom well but the long gowns were interesting as were their efforts. Next, the dancers each picked members of the audience and one fellow from our English Group 8 was chosen.He obligated, grinning. I’m glad it wasn’t me. Brave couples joined the dancers for the Chicken Dance, the Macarena, the Twist, a line dance and a jive. I noticed two young guys (late thirties?) appeared to share the same girl for dancing. I’m always surprised when any male gets up to dance without a gun to his head. I guess the spirit really moved these two to shake their booties. Robert, our first tour guide in China, was on board with a new group of tourists. We the English Group 8 had no one while on the ship, unlike all the other groups. Cocktails over, the crew lined up across the dance floor, toasts were made and drunk. The captain schmoozed and moved around the room, but it appeared to me his heart wasn’t in it. A camera guy followed him as close as print on paper. Pictures would be on sale soon after dinner. Monitors with screen shows were available to view and choose photos for purchase. Nothing happens here without a chance of making an extra buck I guess. Cold salads: Romaine; red cabbage; sliced red cabbage; toothpick-sliced raw carrots; chickpeas; Logan (lychee fruit); cubed melon; sliced watermelon and cubed pineapple. After dinner, I sweet talked our young waiter to top up my wine glass, which I then took back to the cabin. Another lady in our group asked for a filled glass as well and gave it to me. I kept Sue talking till around 11:00 p.m. because I didn’t want the lights out yet, and wanted to type up some of my notes from the day. Categories: #travelChina, China, cruise, food, travel, vacation | Tags: Yangtze | Permalink.